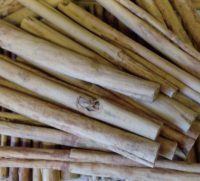 5 x 6 Cinnamon sticks form Sri Lanka. Goes well in Ginger or Christmas beer and also many uses in the kitchen. Can be used with the following ingredients to form a fragrant hot and spicey rub for meet and fish:- Hot and fragrant spice rub 2 tbs fennel seeds2 tbs cummin seeds2 tbs coriander seeds1/2 tbs fenugreek seeds1/2 tbs black peppercorns1 clove2 cardamom pods1/2 a cinnamon stick salt and freshly ground black pepperL ightly toast all the ingredients then grind to a powder. Add to either yoghurt or oil and use as a marinade. Ingredients: Inner peeled bark of Cinnamomum zeylanicum. Grade C5 Special. Allergy Advice: Cinnamon contains a naturally occurring source of salicylates and is best avoided by people eating a salicylate free diet.